In this post, it is shown how a simple Java UDP server and client socket application can be implemented. For this example, Java SE 8 and the Eclipse Neon IDE setup described in the post below was used. The Java APIs for socket programming are part of the Java SE (Standard Edition). See java.io and java.net. Below is the Java source code for the UDP server socket implementation. It opens a UDP socket connection and listens to messages from clients on a given port. The server socket is created in line 16. See java.net.DatagramSocket for more information. The DatagramSocket.receive(DatagramPacket p) method, called in line 28, blocks until data is available to read from the socket connection. The data read from the socket is stored in a DatagramPacket object. The main method in this class requires a port number as an input argument. Below is the Java source code for the UDP client socket implementation. It connects to a listening UDP socket using a given port and then sends console input to the server. In line 35, the client uses the DatagramSocket.send(DatagramPacket p) method to send a UDP message to the server. The main method requires the hostname or IP address and the port number as input arguments. Here, the server and client socket will run on different machines in a 192.168.56. * local network. Where the only input argument is the port number, here 7077. Where the first input argument is the host name and the second one is the port number. In the client socket application, type a message and press ENTER. The server socket application, will simply print the message from the client. Message from 192.168.56.10: Hello from the client! Use CTRL + C to stop the both Java applications. 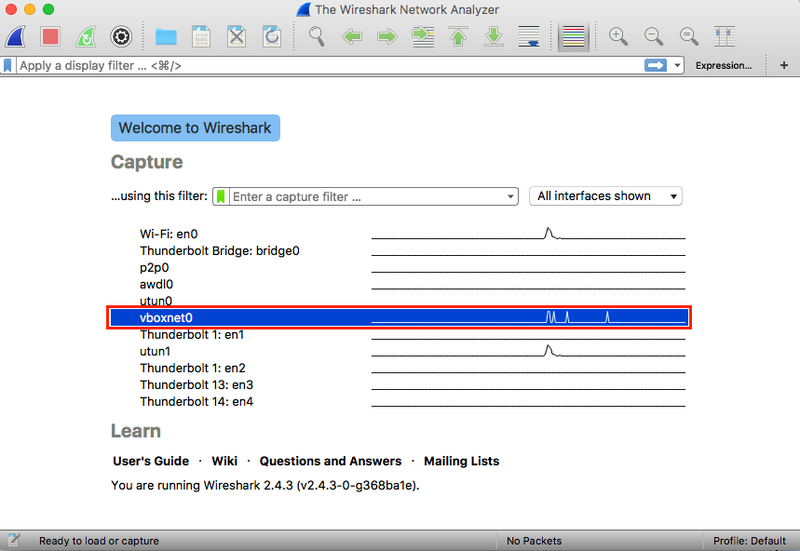 Wireshark is a free tool for monitoring network traffic. It is available at www.wireshark.org/download.html. After installation, run Wireshark and select a network interface to capture traffic on. Here, the UDP socket client is running on Ubuntu hosted on a virtual machine using Oracle VirtualBox. The virtual machine and the host machine use a host-only network called vboxnet0 to communicate. Send messages from the client- to the server socket to capture traffic. 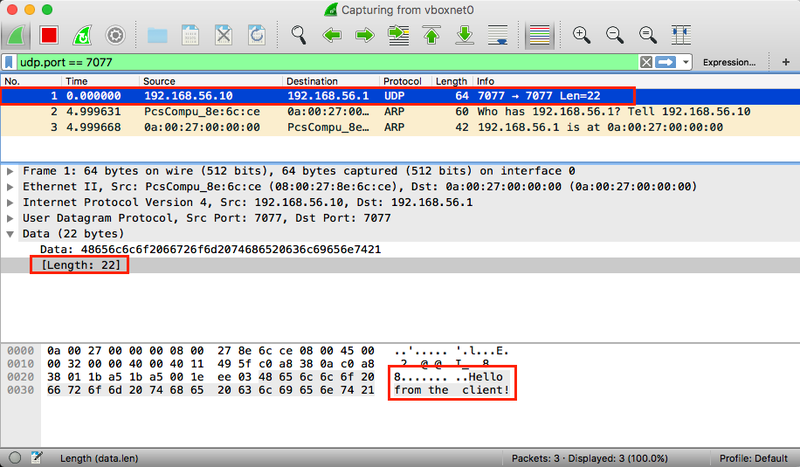 To view the payload of a UDP packet, expand the Data node and click on the [Length: ..] item. 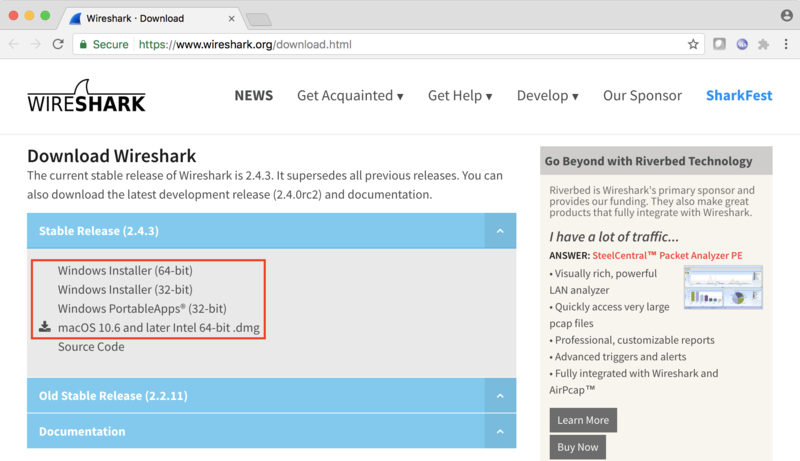 For more information on using Wireshark, refer to https://www.wireshark.org/docs/wsug_html_chunked/. do this work over both ipv4 and ipv6? It should, refer to https://docs.oracle.com/javase/8/docs/technotes/guides/net/ipv6_guide/index.html for more information.